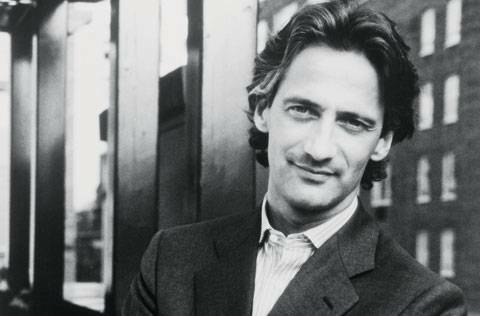 Very rarely will you come across a true virtuoso, one whose infinite power of conviction overtakes you with the burning desire to go out and do something to “change the status quo” and fulfill your own dreams, a man so humble that he makes his own infallible success look easy. But this is the exact impact that Sheldon Adelson, chairman and CEO of Las Vegas Sands Corporation, has had on myself and the many others he has graced with his inspirational words. His single-minded determination has seen his star rise to the top 10 of Forbes’ illustrious lists, year after year. The son of an immigrant taxi driver living in the less-than-desirable city of Dorchester near Boston, Adelson’s unique business savvy and resilience came at an early age. “I grew up in the wrong part of town and came from the wrong [ethnic] background,” says Adelson of his Russian-Jewish roots, which were out of place in the infamously conservative New England town. His first business venture came at the age of 12 when he borrowed $200 from an uncle and bet it all on himself, starting a newspaper delivery business. While it may have been his first real gamble, he was able to control the odds and ensure a favorable outcome. A stint at the City University of New York ensued, and Adelson chose not to complete his studies. Instead he decided to expedite his future success, gaining the invaluable skills of an investment broker and financial consultant. Determined as he was to succeed, Adelson would never have foreseen that he would one day see his own company traded on the New York Stock Exchange. “Since I worked at Wall Street in 1956 as an advertising salesman for a financial magazine, I was always in awe of the New York Stock Exchange, and now that I’m listed there, it’s an achievement of a lifetime,” says Adelson. The gaming tycoon’s first foray into Las Vegas came with Comdex, a wildly successful computer exhibition that sold space purchased at $0.15 per square foot for $55 per square foot, creating a profit margin of 70%, a staggering return that, ironically, had never been attempted on the Strip. The idea with Comdex was simple: attract visitors to Las Vegas for reasons other than the weekend gambling jaunts that brought Sin City its name. “I was Las Vegas’ biggest customer. It was obvious to me that they were underselling. They used to sign up groups and say, ‘I can cancel your group within thirty or sixty days of the time it occurs if there is something going on that can fill up the casinos in Las Vegas during that period.’ So no one would book conventions there, and that’s ridiculous. So I determined, knowing the market, that I could bring people in on the weekday which was the big ‘valley’ period in the week cycle,” recalls Adelson. With the subsequent introduction of Adelson’s 1.2 million-square-foot Sands Expo and Convention Center, Las Vegas was firmly placed as the leading MICE (meetings, incentives, conventions, and exhibitions) venue in its region. Slow and steady success ultimately came to an unstoppable climax when, in 1988, Adelson, who sold his Interface Group Show Division (including Comdex) for an alleged $860 million. Instead of retiring and riding out the rest of his life on the profits, Adelson went all in with one of the riskiest gambles the Strip has ever seen: he purchased the floundering Sands Casino for $128 million. The Sands’ glory days, where Sinatra and his fellow rat-packers were regulars, had been replaced by an era of casino kitsch. Suddenly shabbily clad weekend tourists overtook smartly dressed gentlemen of the 70s. Holding the unique, unbiased view of a Las Vegas outsider, Adelson knew something had to be done. Little did his competitors realize that his grand $1.5 billion scheme would single handedly rehash what Vegas meant to the world. “As I listened to Sheldon Adelson talk about his vision of recreating the Italian city of Venice in the desert, I realized we were about to make hotel history. And with a total budget of $1.5 billion, the possibility existed to make it truly remarkable,” recalls friend and Venetian Las Vegas and Macao designer Trisha Wilson. 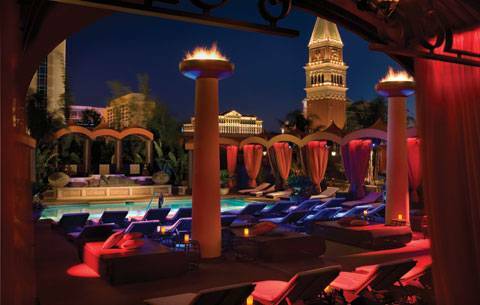 With the launch of Adelson’s sophisticated all-suite Venetian Hotel and the Sands Expo and Convention Center, Las Vegas was once again a destination of class and multi-faceted entertainment. Not only is the architectural detail of this, the world’s largest casino resort (now, outdone only by it’s Asian counterpart), rivaled to the Italian city itself, the Venetian also hosts a plethora of refined art and entertainment venues, from a dedicated theater for the Las Vegas production of The Phantom of the Opera to the Guggenheim Hermitage and Madame Tussauds museums. This shift of focus from gambling is precisely what Adelson cites as the key to his success in Las Vegas. While his hotels do, and always will, have a casino component, it is well disguised against a larger entertainment backdrop. “The perception of Las Vegas is wall to wall casinos, and I’m sure that was done intentionally. The first thing you see when you walk into a Las Vegas hotel property is the casino, but in our hotel-the Venetian-the casino occupies one percent of the total amount of space in the building,” says Adelson. Never content to stop challenging himself, and always the avid and calculated risk-taker, Adelson bets big that the Sands can flourish in the Asian gambling capital of Macao. With a perfect blueprint and undisputed success story in hand, Adelson sought to recreate the Las Vegas Renaissance. The former Portuguese colony was infamous as a day-trip destination where shady gambling dens and prostitution reigned supreme. But, in 2004, the introduction of the Sands Macao, the territory’s first Las Vegas-style casino, catalyzed an evolution from a day-trip destination to an upcoming resort haven. The Sands Macao Casino recouped its entire investment within its first year of operation. This August saw the launch of the Venetian Macao, a larger replica of its Las Vegas counterpart. The 3,000-suite property, and the second-largest building in the world, has already begun to show unprecedented returns for the island territory, proving once again Adelson’s knack for producing the winning formula. The next step in the repositioning of Macao will be the Cotai Strip, named for its Las Vegas equivilant. “Think of it this way: we’ve got a big helicopter and we put a couple of slings under the Las Vegas strip. 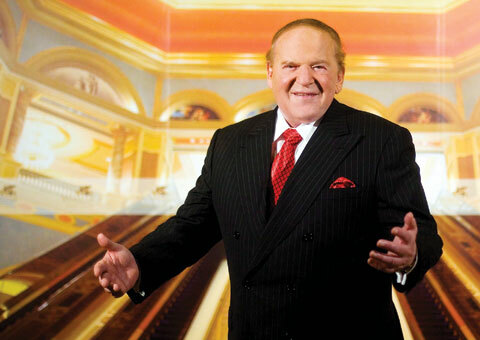 We pick the whole thing up and we move it to Macao, and just drop it there,” jokes Adelson. A plethora of integrated resorts will be joined by several entertainment venues (including a dedicated venue for Cirque du Soleil), an unrivalled 15,000-seat sporting venue, and, of course, sprawling convention spaces. Renowned hotel giants such as Four Seasons, St. Regis, Fairmont, and Shangri-La are already slated for the Cotai Strip. The immediate future of Las Vegas Sands will see the December 20 launch of the Palazzo Las Vegas, whose arsenal of 3,025 suites will be joined by 450,000 square feet of shopping, entertainment, and dining, including Jay-Z’s Las Vegas version of the 40/40 club. An exclusive set of high-end three to four bedroom suites, complete with media rooms, private pools, and personal gyms and spas will set the new standard for Las Vegas luxury. Also on the Sands horizon is the Marina Bay Sands in the ultra conservative nation of Singapore. In a most contested clash of gaming titans, Adelson beat out rivals MGM Mirage and Harrah’s Entertainment to win the coveted Singapore gaming license. Set to open its colossal doors in 2009, the $3.5 billion integrated resort will feature 2,500 5-star hotel rooms, 1.2 million square feet of flexible MICE space, and 1 million square feet of retail and dining spaces, all set out over 51 acres overlooking the Singapore skyline. Future areas of interest for Las Vegas Sands include Japan, Korea, South Asia, Europe, and South America. “By the time I open up mini Las Vegases in all those cities, my great grandson will be attending champagne breakings and ribbon cuttings,” says Adelson with the true fervor of a visionary. But hot at the heels of any successful visionary are a host of competitors: how does Adelson view his competition? “Trump has done a very good job of trying to capitalize on his name, and Wynn is trying to duplicate that. Everyone has their own strategy, it doesn’t mean one is more right than the other, but if the name of the game in commercial enterprise is to make money, the person who makes the most amount of money with the least investment, to me, is the winner,” responds Adelson, clearly confident of his own ability to emerge victorious. “I don’t necessarily see competitors as competitors-I’m not in a race. I just do the best I can, and wherever I end up, I end up, but I hate losing more than I love winning!” he quips. Throughout his meteoric success Adelson has always kept worthy causes close to his heart. One such cause stems from his beloved wife, renowned physician Dr. Miriam Adelson, who has pioneered research in the biology of addictive diseases. “My wife, who’s an angel dressed up as a woman, is one of the world’s experts in the subject of narcotic addiction, so we want to do more studies on this. This is a labor of love for her, and therefore it’s a labor of love for me. She wants to help out the poor, unfortunate victims of this scourge of drug abuse, because it’s not a common favored practice with other physicians, and it’s not a high dollar return.” Together, the Adelsons have opened centers for research and treatment in Nevada and at Tel Aviv University in Israel in hopes of producing groundbreaking research in this often-ignored and deplored health crisis. That is perhaps most commendable about Sheldon Adelson is his ability to use his status as an “outsider” to his advantage. He has, time and time again, emerged victorious by reshaping the destinies of entire cities. “My MO in business is to change the status quo. If you change the paradigm and operate successfully, people will follow you like a shadow,” he asserts. And now, as his greatest critics applaud his work, Adelson finds infinite satisfaction. “I read something the other day that said, ‘It appears as though the business model that Adelson and [Las Vegas Sands] designed, which everybody said wasn’t going to work, works.’ And that, to me, was as good a compliment as I can get.” As Sheldon Adelson’s net worth continues to rise, people and critics around the globe are placing bets on whether or not this son of a Boston taxi-driver’s rank on Forbes’ list will soon surpass that of Bill Gates, making him the greatest success story of our time.